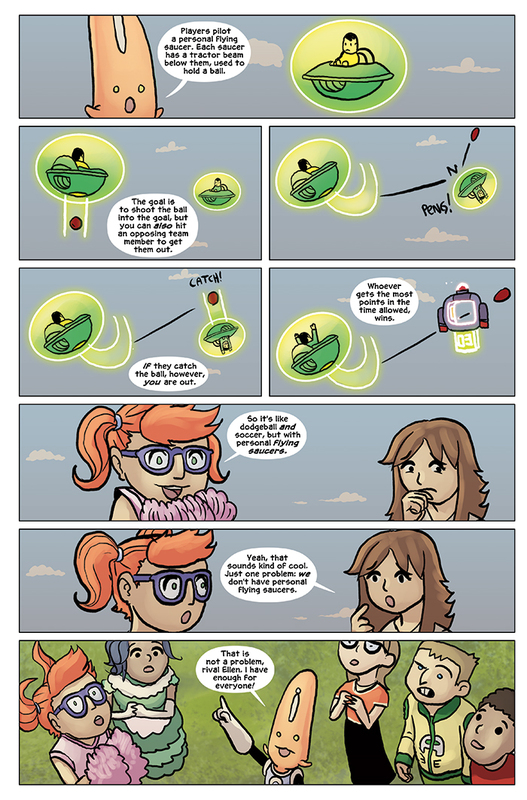 Albert explains the rules of a new alien sport, Bumper Saucers, in today’s comic update! When trying to come up with a new alien sport, I was trying to combine my favorite things from growing up (namely, kickball and dodgeball) – but also figure out how an alien would do it. Aliens have flying saucers, which typically grab things from underneath themselves. So I figured, wouldn’t it be fun to do that with a sport of some kind? So you have a vehicle and you have a ball (or an object), and then you just have a basic sports formula: offense vs defense. So if you combine all of these things (kickball, dodgeball, and alien flying saucers) you get Bumper Saucers! It’s not like Quidditch with aliens…They have broomsticks, we have flying saucers. It’s very different. So how will this alien sporting event unfold? Find out in the next update! I’m attending New York Comic Con (NYCC) this weekend, running the Reading with Pictures booth (#441). I’ll have copies of READING WITH PICTURES (volumes 1 & 2), ALBERT THE ALIEN, JUNKYARD CHASE, and the premiere of my new story in the KILLER QUEEN anthology from Red Stylo Media. If you get a copy of READING WITH PICTURES from me on Thursday or Friday, I’ll put a sketch of your favorite character in the book! There will also be original art (sketch cards), and I’ll be taking commissions for the first few days of the show.